LOCK HAVEN –Collection boxes for new plush bunnies are available in several locations, to support the Susquehanna Valley Big Twins’ ninth annual Bunny Run. During the Bunny Run, motorcycle riders and drivers of other vehicles deliver stuffed animals to hospitals and homes for the elderly in our area. Donations of bunnies are needed by March 24. The boxes are located in downtown Lock Haven at The Express, Tropical Tanning, and PAMP screen printing; at the 40&8 club along Renovo Road near Lock Haven; Corbin’s Footwear/Sears on High Street, Flemington; Bald Eagle United Presbyterian Church in Mill Hall; the Drier and Deiter law office in Jersey Shore; the SVBT clubhouse and in other locations. LOCK HAVEN — St. Luke’s Church of Christ will be holding a soup sale fundraiser on Saturday, March 24. Soup may be pre-ordered for pick-up by calling the church office at 570-748-5741, Tuesday through Thursday from 9 a.m. to noon. Soup will be $5 a quart and soups offered are ham and bean, vegetable and chicken corn. Soup may be picked up at the church on the March 24 from 9 a.m. to noon. WILLIAMSPORT — Martin Hula will present “Life in a coal mining town,” from 1-2:30 p.m. on March 24 at the Thomas T. Taber Museum, 858 W. 4th Street, Williamsport. Martin is a lifelong resident of Pennsylvania. He enlisted in the U.S. Army two weeks out of high school and has served honorably overseas. After his discharge, he attended Lycoming College on the G.I. Bill. He is married to the love of his life, and is the proud father of two beautiful and talented daughters and one gorgeous granddaughter. His early life was spent in a small coal-mining town in Pennsylvania. This experience is what inspired him to produce this presentation. He has also written and published three novels, “The Coal Picker”, “Soul of a Fool”, and “My Patch of Bitter Earth”. These can be purchased at his presentation and other locations. 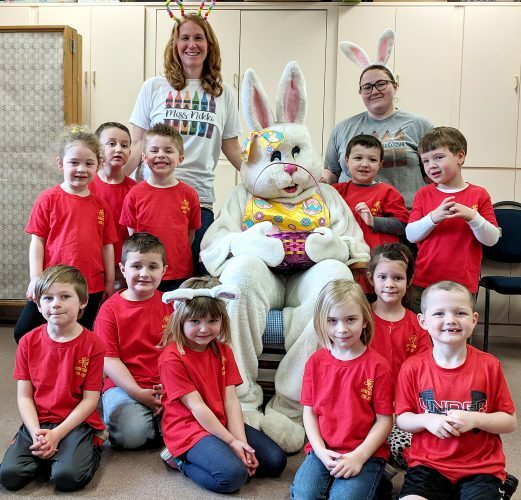 MILL HALL — The Kiwanis Club of Mill Hall invites babies through 10-year-olds to the club’s 12th annual Easter egg hunt, set for 2 p.m. Saturday, March 24 in Mill Hall Community Park. The club plans to use close to 10,000 eggs, and Kiwanians have collected cash and other prizes worth more than $3,000, with more donations still coming in. WILLIAMSPORT — A Lycoming Audubon bird walk is offered on the Susquehanna Riverwalk at 9 a.m. Saturday, March 24, weather permitting. This is an easy walking event to look for waterfowl, songbirds and raptors such as bald eagles and peregrine falcons. Loaner binoculars are available. Leaders are Maddi Dunlap and Jean Dalton (570-777-0713). Those participating will meet on the dike by the South Williamsport recycling center. Parking is available on Matthews Boulevard near Poke Alley. LOCK HAVEN — Wendy Akeley Stiver will be the guest speaker at the eighth annual Colonel Robert and Helen Burgess Terrill Lecture at Lock Haven University from 2 to 3 p.m. Monday, March 26 in Stevenson Library. While a student at the college, Stiver worked on the campus newspaper. She was employed by the Renovo Record for two years as reporter and editor and is the community editor at The Express newspaper in Lock Haven where she has worked for more than three decades. A native of Lock Haven, she has seen the LHU campus grow up around her and around Akeley Lane, where she lives. She is a graduate of Akeley School and is a granddaughter of Archibald Paul Akeley. The lecture is free and open to the public, and refreshments will be served. For more information about the event, contact Bernadette Heiney at 570-484-2545 or by email at bheiney@lockhaven.edu. LOCK HAVEN — Keystone Central School District will again help nine municipalities run the Summer Recreation Program. College students are needed to supervise the 12 playgrounds and one swimming program this summer. College students with education majors or recreation majors could find this experience especially valuable, as could anyone interested in working with young people. These are paid positions. Paid internships also are available. All interested persons should send a letter of application to: Director of Recreation, Keystone Central School District, 20 E. Church St., Lock Haven, Pa. 17745 or by email to jbailey@lockhavenpa.gov. The deadline for receiving applications will be March 30. In addition to Keystone Central and the participating municipalities, the Summer Recreation Program is supported by Clinton County government and the Clinton County Community Foundation. LOCK HAVEN–UPMC Susquehanna Lock Haven is currently accepting applications for the 2018 Lee & Bessie Graham Scholarship for Nurses. The late Bessie Graham, a native of Lock Haven, established the scholarship trust in 1979 to assist graduates of Clinton County high schools who are interested in pursuing a career in nursing. r Be a Clinton County high school senior accepted in a nursing school program. r Be a current nursing school student who graduated from a Clinton County high school. r Complete an official scholarship application, provide proof of acceptance or enrollment in a nursing school program, and provide school transcripts and completed individual or parents’ current year income tax forms and references. The 2017 Graham Scholarship recipients included Chelsea Boone of Lock Haven, Haley Francis of North Bend, Sierra McCombs of Blanchard, Karli Coleman of Lock Haven, Morgan Askins of Howard, Kristen Probst of Howard, Macy Waltz of Lock Haven, and Michael Snodgrass of Mill Hall. To receive consideration for the Graham scholarship, complete applications must be submitted by Monday, April 30. For more information, call 570-893-5025. Applications are available on the Student Opportunities page at UPMCSusquehanna.org. WILLIAMSPORT — The First Community Foundation Partnership of Pennsylvania (FCFP) announces nearly $260,000 in scholarships will be awarded to area students for the 2018-19 academic year. Scholarships will be awarded to graduating seniors from school districts in Clinton, Lycoming, Bradford, Mifflin, Montour, Northumberland, Snyder, Sullivan and Union counties. Additionally, the Community Foundation offers special interest scholarships, which are open to students from multiple school districts or nontraditional students. A complete listing of all available scholarships, guidelines and applications may be found on the website www.fcfpartnership.org, under Apply, Scholarships. Applications also may be obtained from each school district high school guidance department. Deadlines for each scholarship vary. Endowed scholarship funds at the Foundation are created by gifts made by individuals and organizations. These gifts are invested to provide income to award scholarships every year. In many instances, scholarships are awarded based on pre-determined criteria that reflect the personal values and interests of those who establish the funds. The Foundation’s organizational mission is to improve the quality of life in north-central Pennsylvania through community leadership, the promotion of philanthropy, the strengthening of nonprofit impact and the perpetual stewardship of charitable assets. The Foundation continues creating powerful communities through passionate giving®. For more information on the programs and services offered by the Foundation, or to learn more about ways to make a difference in your community, call the Foundation office at 570-321-1500.